Raith Rovers retained their position at the top of Group D in the Betfair League Cup, with a late win over a resolute Montrose side. Manager, Gary Locke made just one change to his starting eleven from Friday evening’s 2-1 win over Cove Rangers, with Mark Stewart dropping to the bench, meaning a first competitive start for Yaw Osei, after he impressed after coming on as a substitute during that victory. Attacking midfielder, Scott Roberts took a place on the technical area, after signing from Rangers on a loan-deal earlier in the day, while summer acquisition, Jean-Yves M’Voto was also named amongst the substitutes. Montrose were looking for their first points in the group, although they were hoping to build on an encouraging performance against Ross County at the weekend, with a late Brian Graham penalty five minutes from time, all that separated the teams. The early stages were fairly low-key, with the only notable incident occurring when Gary Fraser was nudged into the advertising hoarding by Jason Thomson, a situation which was compounded by the Montrose forward skiting along the gravel as he looked to take a dull one, before recovering to continue. The placid situation altered after ten minutes however, when Osei capitalised on some slipshod defending and cantered through on goal, as keeper, Jordan Miller advanced to narrow the angle. However, with Lewis Vaughan running alongside, his front partner’s presence seemed to distract the former Reading striker, and his bobbled finish dribbled wide. 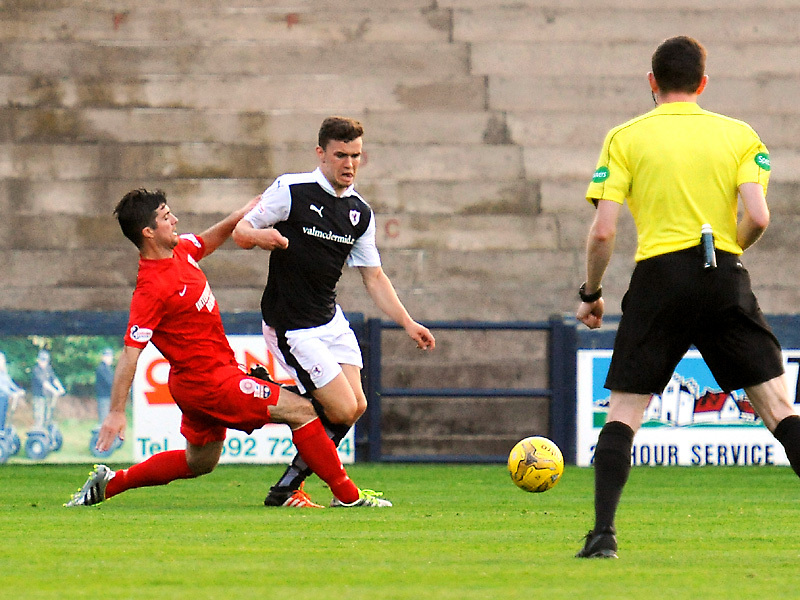 Two minutes later though, the glaring opportunity was forgotten about, as Raith took the lead. A low cross from the right from Thomson evaded everyone bar Bobby Barr at the back-post, and he sent it back into the area, for Chris Johnston to tap home, giving the new scoreboard in the Railway Stand its first goal to register. With the early signs suggesting Rovers were the superior outfit, you sensed at that stage that Paul Hegarty’s side were potentially facing a long evening, but to their credit, they stabilised themselves afterwards, and while they weren’t exactly threatening, a chance from just inside the area was flashed over from Paul Watson after a corner from Terry Masson. If Montrose were going to get themselves back into the match, then they were going to have to make the most of the scraps they had to work with. On the flip-side however, while Raith were keeping the ball in an aesthetically pleasing manner, it wasn’t leading to a barrage of shots on Millar’s goal. With ten minutes of the half remaining, the home side rustled up the best move of the match. Ross Callachan played a wonderful first time ball to Thomson, and his cross was turned goalwards by a first-time effort from Osei, but Millar was equal to it, parrying it away from danger to deny the bustling Osei his first goal for the club. It was the final chance of a half which Raith had impressed in fits and starts, and while they’d huffed and puffed, they’d toiled to blow Mo’ away. Rovers were looking lively at the start of the second-period, as Osei pounced upon a mistake from Greg Pascazio, and while his run towards goal was crowded out, Johnston gathered up wide on the right, shuffling inside and ruffling the side-netting with his attempt from distance. Raith then should have made it two on 53 minutes. A lovely interchange between Vaughan and Barr saw the latter in on goal, but while the winger was at a tight angle, he should really have done better than screw his shot wide. A moment later they came even closer, although this time it took excellent work from Millar to deny them. Just as Barr had been previously, Vaughan found himself on the left-hand side of the area with just the keeper to beat, but his shot was repelled excellently by Millar, who then completed a double save as he sprung up to deny Callachan who was following in. A second goal at that stage would presumably have made the game and points safe, but instead, with half an hour to play, Montrose restored parity. A corner-kick was swung into a dangerous area, and defender, Michael Bolochoweckyj nipped in to nod the Mo’ level. It was a goal which was squarely against the run of play, but Rovers had only themselves to blame, after failing to capitalise on their superiority up until that point. Five minutes later, Gary Locke rang the changes, swapping Osei and Johnston for Scott Roberts and Mark Stewart. The changes, coupled with the equaliser saw a renewed sense of urgency from the home side, but while the channels were being worked, the play was petering out as the ball came back inside, with sparse few chances being created against a dense and stingy Montrose defence. Possession was easy to come by, but Rovers were toiling to ask questions of the away side, with infrequent shots from distance crowded out or off target. However, just as it seemed Rovers had exhausted their options, they grabbed the lead with four minutes remaining. 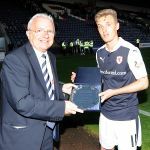 Kevin McHattie had made his way into the penalty area, and much to the Montrose players anger, referee Colin Steven saw fit to award a penalty, after a Montrose defender appeared to make contact with the full-back during the act of shooting. 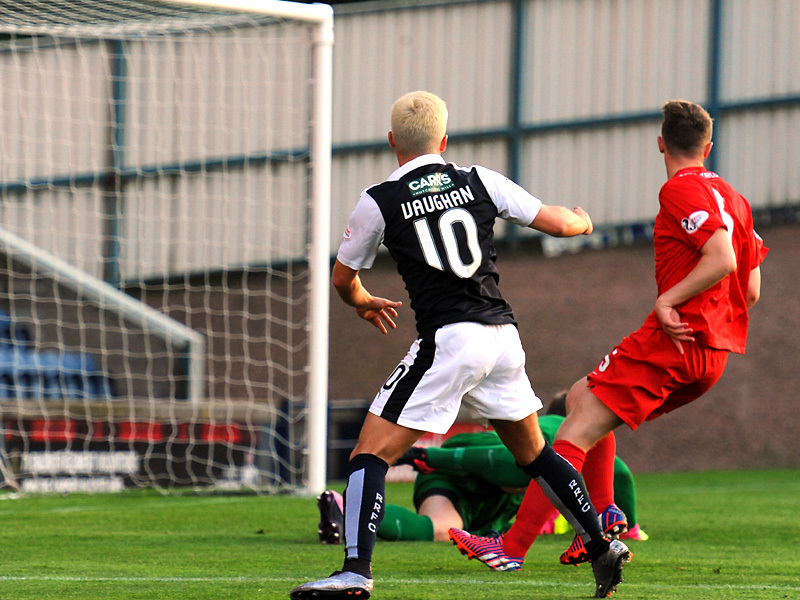 From the resulting penalty, Vaughan retained his composure, dispatching his shot confidently passed Millar to hand Raith the advantage once again. In the aftermath, referee, Steven saw fit to dismiss experienced Montrose forward, Chris Templeman, presumably for the striker delivering a forthright opinion to the official for his penalty decision. 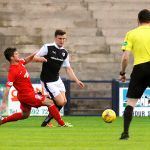 The spot-kick had dug Rovers out of a tight-spot, and the Angus outfit must have been crestfallen at the loss of two games in such a short space of time in such similar circumstances. Rovers now head to Dingwall this Saturday, where they’ll look to sustain their 100% record against the holders, Ross County. Welcome to Starks Park for tonight's Betfred match, our visitors are Montrose. It's a glorious evening in Kirkcaldy, 24 degrees with a slight breeze. 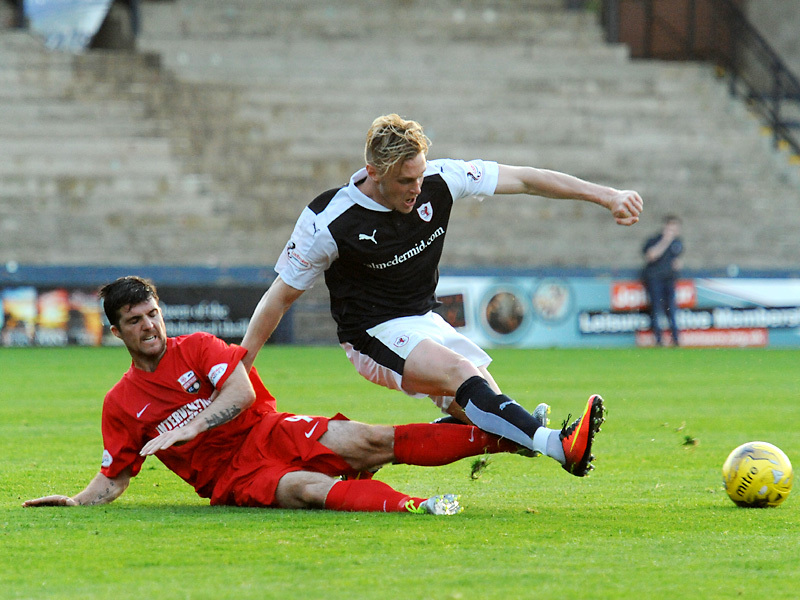 Raith have won the last four meetings between the sides, most recent in 2012, Raith winning 5-2 that day. 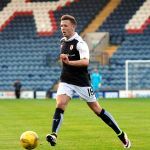 Montrose were narrowly beaten by a late Brian Graham penalty on Saturday, Raith came from behind to beat Cove Rangers. Osei is the only change to Saturday's starting line-up, replacing Stewart. Tonight's referee is Colin Steven, his assistants are Graeme Stewart and Connor Ashwood. Montrose kick off towards the South Stand. Free kick lofted in by Mchattie, easily cleared by the Montrose defenders. Fraser down on the right corner(Main Stand) after a nasty collision with the advertising board. He's OK and able to continue. Paul Watson with a low effort, his low drive is well wide of Cuthbert's left hand post. 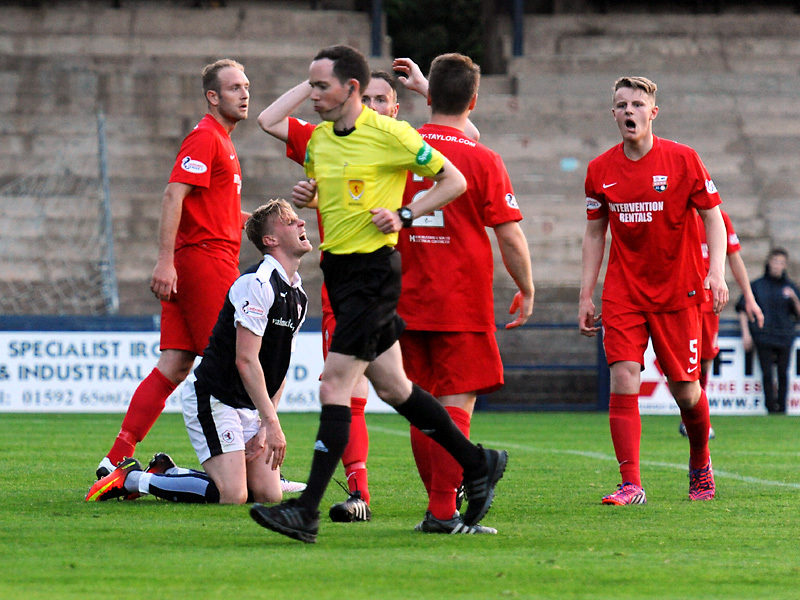 Raith starting to stamp a bit of authority on the match. Two quick corners, no clear cut chances. Kevin Mchattie taking the corners, his deliveries are encouraging. Osei does well to make an opportunity for himself but scuffs his effort wide of Millar's left hand post when clean through. Osei with another effort, again his left footed effort trickles well wide. GOAL!!! Barr plays it across the box and Johnston is credited with the finish, firing home from close range. Good work by Vaughan in the build-up, finding Thomson on the right, who crossed for Barr. Barr and Johnston have switched flanks already this evening, Barr now on the left wing. Chance for Montrose, Watson firing from close range, well wide. Good run from Callachan, he finds Barr but his cut back has no takers. Good play between Johnston and Barr, Barr seeing his powerful drive hit Millar's right hand post. Players taking a water break, sensible in this weather! 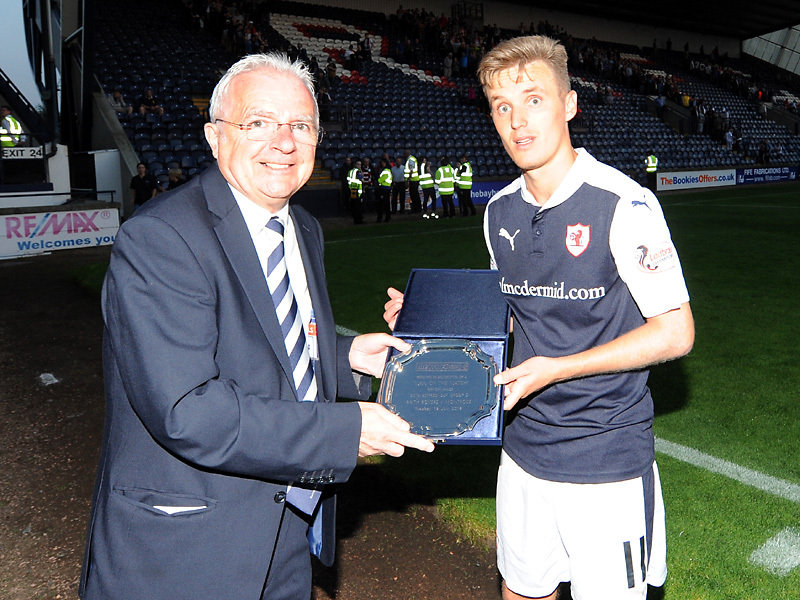 Great move by Raith. Callachan plays a clever reverse through ball for Thomson, his cut-back finds Osei, who sees his powerful drive blocked. Free kick to a raith , 30 yards from goal. Vaughan's effort well held by Millar. Davidson clears for a throw inn. Ross Campbell, the long throw specialist for tonight's visitors. 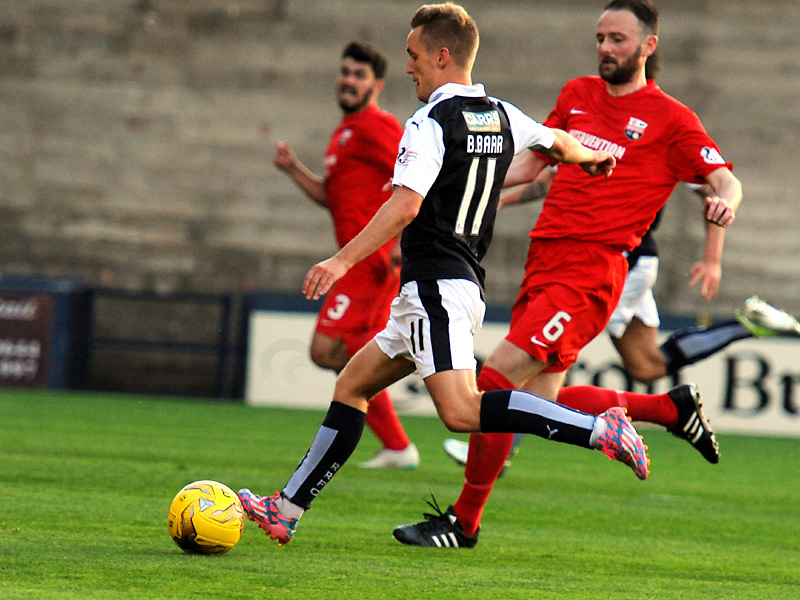 The raith defence clear well, with Templeman ready to pounce. Montrose pressing for an equaliser. Corner, to be taken by Terry Masson. Michael Bolochoweckyj attempts to convert with his hand, which is spotted by tonight's referee Colin Steven. Raith kick off towards the South Stand. Johnston does well do find space, his low drive is just wide of Millar's left hand post. Loud calls for a penalty by the Montrose players, nothing given. Bobby Barr uses his pace to be one on one with Millar. His effort is too high and misses from close range. Good play by Vaughan, his low drive is well saved by Millar. Callachan pounces on the loose ball but his powerful effort is well blocked. Goal Montrose, Bolochoweckyj with a header from the corner. Raith being punished for not taking any of their numerous chances. Montrose with a spring in their step after that equaliser. 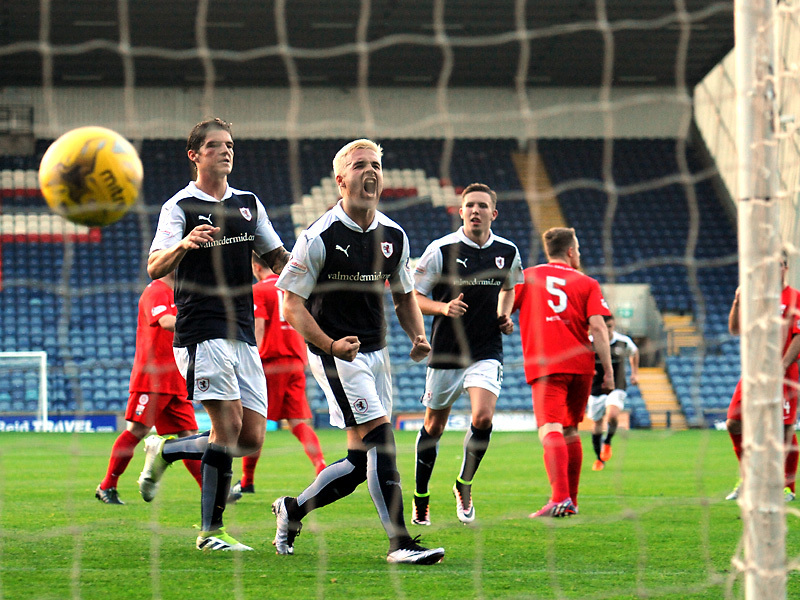 Free kick Raith from 27 yards, Mchattie's effort is blocked by the wall. Double substitution from the rovers. Osei and Johnston replaced by Stewart and Roberts. Good build-up play by Roberts, Barr scuffs his effort well wide. Montrose trying to slow the game down at every opportunity. Change for Montrose, Mcwalter replaced by Lennie. Cuthbert down after a collision, he's OK to continue. It looks like we could be headed for penalties. 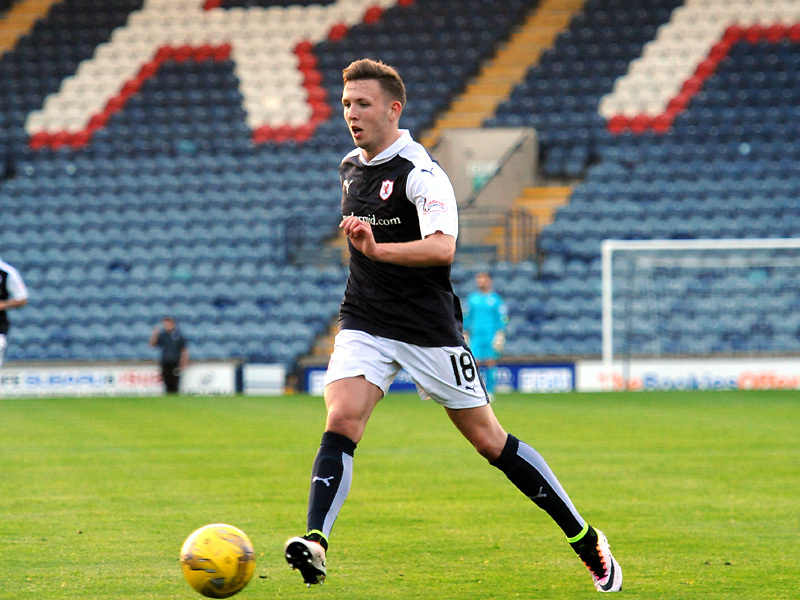 Raith not offering a lot going forward at the moment. Booking for Masson. He brought down Mchattie. Goal, Vaughan dispatches the penalty, low to Millar's right. Templeman sent off, no idea what for! 1,147 spectators inside San Starko tonight. Think it was two yellows for Templeman, presumably for dissent after the penalty award. Full time,2-1, we made hard work of that but a win's a win! 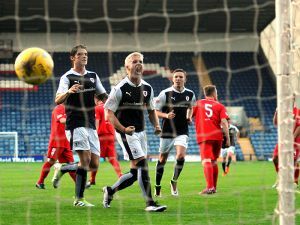 Raith Rovers will be looking to build on their winning start to their Betfred League Cup campaign, when Montrose become the first visitors to Stark’s Park this Tuesday evening. It’ll be the first time the two sides have played each other in four years, since the two were paired together in the opening round of the Ramsdens Cup in 2012. Rovers came out on top by five goals to two that evening, despite David McGurn being dismissed in the first half, with goals from Allan Walker, Pat Clarke, Greig Spence and a double from Brian Graham allowing Rovers to ease to victory. Paul Hegarty’s Montrose will be looking to improve on a difficult season last term, which saw the Angus outfit finish eighth in League Two. To that end, Hegarty has brought in six new faces to the Links Park club over the summer. The early indications are certainly encouraging for Mo’, with a fine display against the League Cup holders Ross County, almost securing a draw on Saturday, with a late Brian Graham penalty all that separated the two sides. That result, combined with Rovers 2-1 win over Cove Rangers on Friday evening, mean Raith currently top the table on goals scored, while Montrose prop up the five-team pool. Only the group winners are guaranteed to progress to the last-16, with the four best runners-up also going through. Tuesday’s other Group D fixture sees Alloa Athletic opening their account against Cove Rangers. Raith Rovers are unbeaten in their last eight meetings with Montrose, with the Mo’s last win against the Langtonian’s coming on the final day of the 1984/85 season with a 3-1 win, a term which saw Montrose win the title, while Raith finished seventh in the old bottom tier. Tuesday evening’s match referee will be Colin Steven.